Russia is a recent example of an Orthodox Christian nation, which, as noted above, has more in common with America than first meets the eye. If there is a country in the world that is akin to America in spirit, it is Russia. Both countries possess wide expanses of land, and people who exude awareness of that breadth. Both contain a variety of colorful cities, each with its own flair. Both have inhabitants who love to travel, and who have a sense of unity through ethnic diversity. In other ways, however, Russia differs profoundly from America. Most importantly, America is philosophically rooted in Enlightenment thought, with man as the measure of things, while Russia is traditionally rooted in Orthodox Christianity. Nations are no more perfect than are people. Still, just as we look to experienced people for advice, so we converts to Orthodoxy should look to historically Orthodox nations to see how Orthodoxy can pervade all of life and not merely our holy days and church services. One of the most urgent messages American converts need to hear is this: American culture is not Christian. If we are to become Christ-like, allowing the Holy Spirit to regenerate us, we will have to reject familiar and beloved things. Most converts to Orthodox Christianity know this. Still, conversion is not as simple as rejecting one’s old church. We must reject our old anti-Christian thoughts, attitudes, philosophies, and ways of life, especially those which are nearly unconscious, ingrained into our daily lives, and sometimes even labelled “Christian.” Accomplishing this change, of course, requires adherence to a personal rule of prayer and spiritual reading. Finding Christian thoughts, attitudes, and ways of life with which to replace the old is also crucial. Russia is a recent example of an Orthodox Christian nation, which, as noted above, has more in common with America than first meets the eye. As such, it has been an excellent place for me to pursue my search. Exploring the history of Holy Mother Russia leads naturally to Byzantium, Rome, the Apostolic Age, and finally to Jesus Christ Himself. This exploration has given me a sense of the centuries-long continuity of the Church; myriad saints, scholars, families, and even institutions throughout the ages provide examples how to fill one’s life with Christian activity and thought. There are men in the history of Russia who are so evidently illumined by the Holy Spirit, acquired through much prayer, fasting, humility, and obedience, that even secular historians cannot hide their holiness. Even the simplest portrayal of everyday life in Orthodox Russia can reveal a world of insight into just how un-Christian our own lives all too often are. Sometimes a single line tucked within a novel or a history book will be all it takes to convict the new Orthodox Christian of his own laxity in prayer or uncharitable thoughts-to remind him that he cannot just go to church and then blend in with American society the rest of the week. As in the time of Tsar Peter I, during our century the institutions and people of Russia have lain beneath the artificial imposition of Western-this time atheist-philosophy. The fact that Russia fell to the communists should not deter us, however, from looking to her as one source with which to begin our replacement of American values with Orthodox Christian ones. 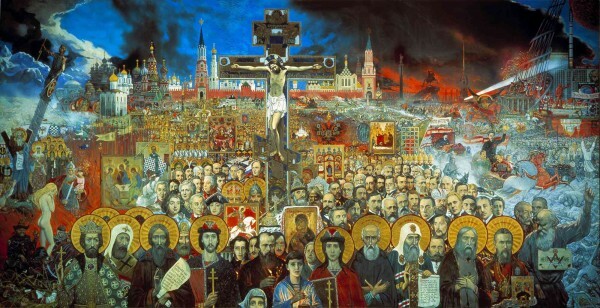 The theology of suffering has been brought into stark relief by the Christian attitudes maintained by many of the Russians in our own century who have suffered every kind of abuse at the hands of the atheist communist regime. Susan Anderson, the author, a convert to Orthodoxy, is a graduate student of Russian History at the Universityof Oklahoma.